Cody Hodgson’s drastic regression over the course of last season brought the possibility of a buyout into the equation as early as the halfway point of the year. Tim Murray reiterated that this week in a conversation with WGR 550, noting that Hodgson is a potential buyout candidate. While he didn’t definitively say if a buyout was coming the writing appears to be on the wall despite the strides Hodgson is taking in Sweden to improve his skating. The question fans are now debating is whether or not it makes sense to use a buyout on Hodgson and his $4.25m cap hit. Hodgson’s down statistical year, tumble down the depth chart and general struggles in the skating and defensive departments make for a long road back for the former 10th overall pick. His advanced stats – as noted by Coller in the above post – were so dismal that even when deployed with better linemates, you have to wonder how much room for improvement there may be. What plays to Hodgson’s favor is the poor fit he had under Ted Nolan. After a pair of impressive years – 34 points in the lockout shortened 2012-13 season and a team high 44 in 13-14 – he hit the skids hard the moment Ted Nolan was hired. This culminated in his 13 point season this year. Given that Nolan was such a poor fit for Hodgson’s skillset and strengths gives credence to the idea of keeping him around for at least one more year. However there are financial reasons to utilizing a buyout this summer as opposed to next. The buyout figure on Hodgson’s sits well below the $1m mark currently. It would jump well above $1m next summer. For a team that’s nearly $10m below the cap floor those numbers are miniscule no matter how you cut it. Even with the expectation that the cap will go up each of the next handful of seasons, ensuring that any sort of buyout counts minimally against the cap is important. Considering that within the next three seasons Jack Eichel, Zemgus Girgensons, Mark Pysyk, Sam Reinhart, Rasmus Ristolainen and Nikita Zadorov will be at the end of their entry level contracts and in need of either a bridge or significant extension, the Sabres will be in need of as much cap space as possible. Many of those same players also will play a role in forcing Hodgson further down the depth chart as well. Murray noted that he’s confident that Reinhart will push for a full time NHL job next year and the addition of Eichel, Evander Kane and at least one free agent or trade target from this summer accounts for four top-six spots. That in addition to Tyler Ennis, Girgensons, Matt Moulson and others. Oh, and Mikhail Girgorenko and Johan Larsson – the latter of whom carries impressive metrics even with less than ideal linemates – also will be pushing for time. So between the ever growing depth chart and the financial benefit, there are a host of good reasons to utilize a buyout on Hodgson. The only opportunity I see for Hodgson in terms of redemption is to make meaningful improvements with his skating this summer and to manage to slot in with some combination of Eichel, Kane, Girgensons, Moulson and Ennis. Hodgson’s future with in the NHL lies in a top-six role. 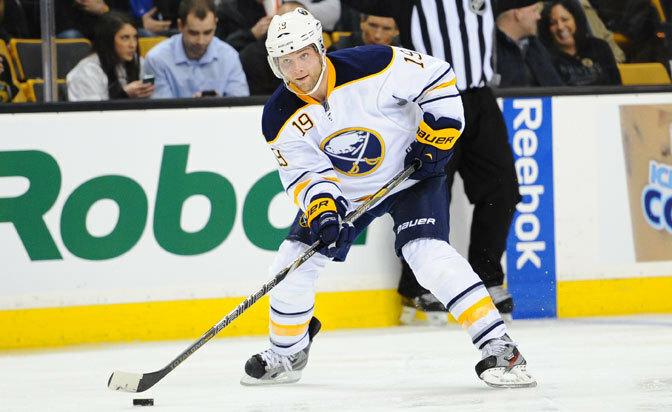 Perhaps, if the Sabres don’t acquire a veteran right winger, Hodgson will have one final opportunity to prove his worth to the organization. Ultimately I feel that the potential areas for redemption for Hodgson are far outweighed by the struggles he’s had along with the long-term outlook for the roster and finances. Buffalo is still a 30th place club until they prove otherwise, but even their unproven prospect pool represents the future of the franchise. It would appear that Hodgson isn’t part of that future and it’s time to move on.